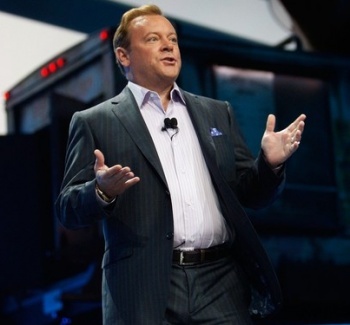 Pachter: Sony's Jack Tretton "Totally Opposed to Blocking Used Games"
The SCEA president calls blocking used games "anti-consumer." According to market analyst, Michael Pachter, who recounted a meeting he had with Tretton at E3. Tretton was responding to rumors that the as-of-yet unannounced successor to the PS3 - which, according to Kotaku, will be called the Orbis - won't support PS3 games and will block the use of used games. Similar claims have been made about whatever console will follow the Xbox 360. Tretton's support of used games seems somewhat hollow, however, given that Sony is currently pushing the PSN Pass system, which requires second hand game owners to buy codes to use their games online. He did qualify his statements by adding that Japanese Sony executives may not see eye to eye with him on the matter. Pachter himself was dismissive of the rumors about the PS4. "I think it will play used games," he said. "That is the dumbest rumor I've ever heard." Judging by Pachter's previous predictions, that means there's a 60% chance the PS4 will block used games. Oh dear.